7 Kids and Us: Robo-Dog: Airborne on DVD March 14th! 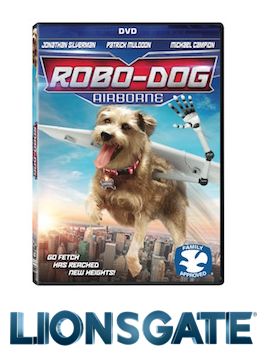 “Go fetch” reaches new heights when Robo-Dog: Airborne arrives on DVD, Digital HD and On Demand on March 14 from Lionsgate. When the world’s most advanced K-9 loses his family and his memory chip, it’s up to his best friend Tyler and his scientist dad to find Robo-Dog and bring him home! In this sequel to 2015’s family film Robo-Dog, Robo-Dog: Airborne “is encouraging and inspirational for young and old alike” (The Dove Foundation). Awarded the Dove Family Seal of Approval, the DVD features limited-edition packaging, the “Ruff Cut: Behind the Scenes of Robo-Dog: Airborne” featurette, and TV’s “Minuscule” bonus episodes. The Robo-Dog: Airborne DVD will be available for the suggested retail price of $19.98.